(Cathexis Press, 2011) is a complex investigation of $30,000 paid to adopt a child, four Guatemalan “orphans,” one nonprofit evangelical Christian adoption agency, a family-run child-trafficking ring, one infant cut from her unconscious mother’s womb, two tiny missing sisters, and a nine-member Tennessee family who believed whole-heartedly in Christian love and faith, until the dark side of international adoption shattered their trust. "Finding Fernanda" is Siegal's first book. >Hear an excerpt of an interview with Mildred Alvarado, Fernanda's birthmother. & "The U.S. Embassy Cables"
"Journalist Faces Corruption in Guatemala Adoptions," Kim Fagan-Hansel, February 2012, AdoptionToday. “Finding Fernanda” is an incredible piece of investigative journalism. The amount of time, depth of research and commitment to this story is evidenced on every page of this book. The book is a page turner and a jaw dropper as the evidence of corruption runs deep and the story unfolds. 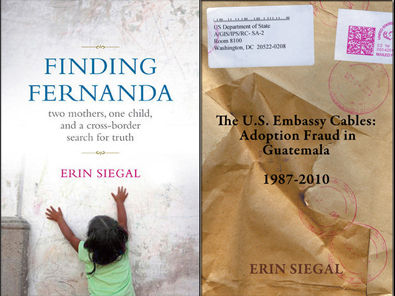 "Child Abduction for Adoption and the Tangled Web of Deceit in Guatemala: A Review of Erin Siegal’s 'Finding Fernanda',” Karen Smith Rotabi, January 31, 2012, RH Reality Check. By the end of this captivating read, it is impossible to see Alvarado as anything but a strong and resilient woman who is determined to fight circumstances of poverty and oppression—its impact on human dignity and the destruction of her family. Some of the details of the dark side of the industry in Guatemala—houses where pregnant women are kept while waiting to give birth, nurseries where children waiting to be adopted are given borderline-starvation levels of sustenance—are Dickensian in their cruelty. But the tone of the book is, perhaps surprisingly, not despairing. Siegal brings welcome attention to the work of the Fundación Sobrevivientes (Survivor’s Foundation), a women’s rights organization founded by an ex-guerrilla, Norma Cruz, that has grown into one of the most important pillars of the country’s fragile civil society. "Finding Fernanda," Whitney Eulich, November 28, 2011, The Christian Science Monitor. This well-researched examination of international adoption captures a world of inexplicable actions–some based on religious faith and others purely criminal–through thoughtful detail and an engaging narrative. Siegal began this work as a master’s project for her graduate degree in journalism, working with documents obtained through the Freedom of Information Act, leaked e-mails, and sources in the US and Guatemalan governments. “Finding Fernanda”–released just in time for National Adoption Month and which Siegal has published at her own expense–reads like a mystery novel, but the facts it reveals are hauntingly true. “DC Update: Interview with Erin Siegal,” February 16, 2012, My Technology Lawyer Radio Show. International adoption Guatemala, January 21, 2012, LBO News from Doug Henwood, Left Business Observer. "A Cross-Border Search for Truth," December 1, 2011, Think, U.S. KERA-FM, Dallas, TX. International adoption Guatemala, Adoption Discussions with Donna Montalbano, November 11, 2011, WOON AM 12.40 Woonsocket, RI. Archive shows at AdoptionDiscussions.com. “Finding Fernada: A Kickstarter Project by Erin Siegal,” Stacy Oborn, July 22, 2010, Hey, Hot Shot!